PayPal Payments Standard is a payment method you can use to accept online credit card payments on your website. You can use it for one-time payments or recurring payments. Before you can set up your Wild Apricot site to work with PayPal Payments Standard, you must set up an account with PayPal. When a visitor fills out an integrated online form on your Wild Apricot website (e.g. membership application or event registration) and chooses to pay online, they will be redirected to PayPal's site to make the payment. From here, they can log into their PayPal account or pay with their credit or debit card. After the transaction is completed, PayPal displays a confirmation page. The confirmation page will include a link back to your Wild Apricot site. To accept online payments through PayPal Payments Standard, you must have a Business or Premier PayPal account. See PayPal account setup for recommended account settings. To integrate your PayPal Payments Standard account with Wild Apricot, you will need your PayPal account ID (your email address) and your PDT identity token. 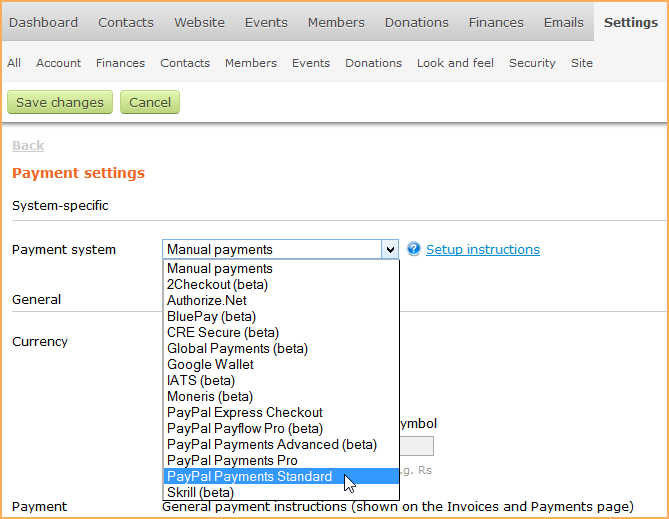 Click the Payment system drop-down list and select PayPal Payments Standard. Enter your PDT identity token.